Film critic Manny Farber, in typical inimitable style, summarized much of Samuel Fuller's film oeuvre through simultaneous praise and critique in the following observation: "What's good about his films is lovable; the daring, uninhibited use of semidocumentary techniques that save the movie from Fuller's mind, an unthinking morass at best" (Negative Space: Manny Farber on the Movies (New York: De Capo Press, 1998, 132). Put slightly more generously, Fuller's film style often trumps the plot, dialogue, and other elements related to narrative coherence. Fuller's mind teems with endless pulp storylines that he most likely assembled during his early career as a beat crime reporter at age 17. Predictably, he wrote pulp fiction before entering Hollywood. But everything he touched later in his career was cast within a sensationalistic and often hackneyed framework. Even the title for Fuller's written account about his time serving in the army during World War II screams like the headline for some trashy tabloid: The Big Red One: The Magnificent Saga of World War II's Incredible First Infantry Division. His excessive use of adjectives in his writing translated into the excessive camera movement found within his films, as if dramatizing almost every scene into its own punchy headline. Oftentimes the camerawork overshot the material, showcasing its own technical brilliance that obscured, minimized, or ran roughshod over the narrative. But when it matched, Fuller's films possessed incredible power. Perhaps one of the best alignments between camerawork and narrative opens Fuller's 1957 Western noir, Forty Guns. A high angle shot opens the film on a small wagon barely moving over a wide expanse of prairie. The film's lack of music punctuates the vulnerability of the wagon lost in an expansive sea of prairie grass. The camera cuts in closer to reveal the three Bonell brothers on the wagon. Griff Bonell (Barry Sullivan), the eldest brother, leads the horses by the stirrups. But the brothers pause as they hear a distant thunder approaching. The sound grows until over the hillside a wild dust cloud appears as 41 horses descend upon them like storm. Shot from under the wagon we watch the horses swarm around and pass the men, causing the Bonell's horses to whiny and buck. The camera then hovers over the wagon as Griff grapples with the reigns while his two younger brothers cower in back, not entirely sure of what they are witnessing. The equine storm passes, leaving them looking on in silence as the dust settles. 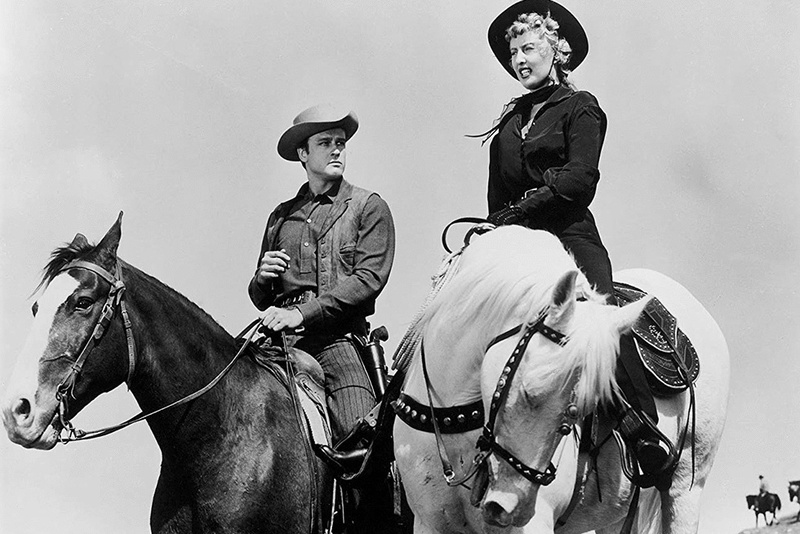 Dramatic strings enter loudly over the soundtrack as the sequence cuts to Jessica Drummond (Barbara Stanwyck) leading the way with her 40 men and horses following her. Poised on a white steed dressed in all black with matching black hat and scarf, Drummond stands out against the all black horses that follow behind her. 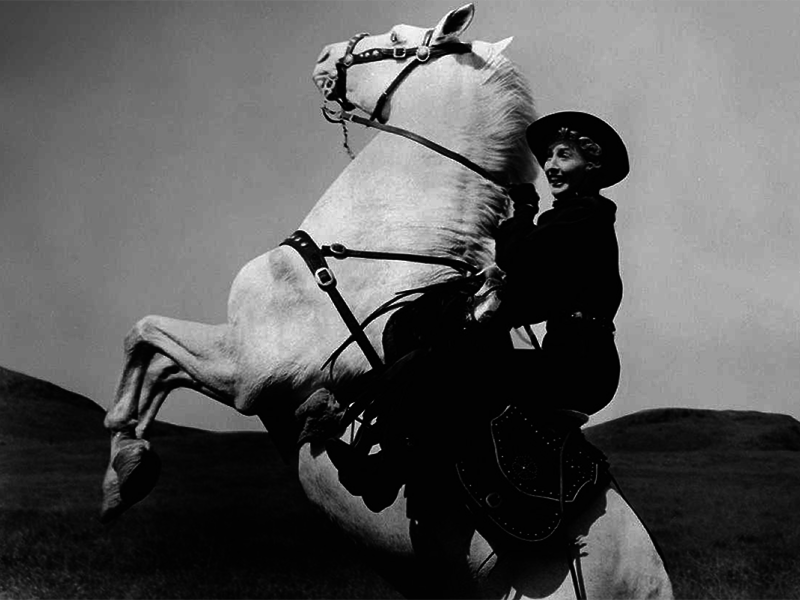 Stanwyck rides confidently, particularly for a woman born in Brooklyn, where the West remained a distant fantasy. The opening sequence reveals Drummond more as a force of nature than a human being, commanding her men and the very environment around her. Her entrance is so overwhelming that it takes the film 20 more minutes to catch its breath and introduce her back into the narrative. 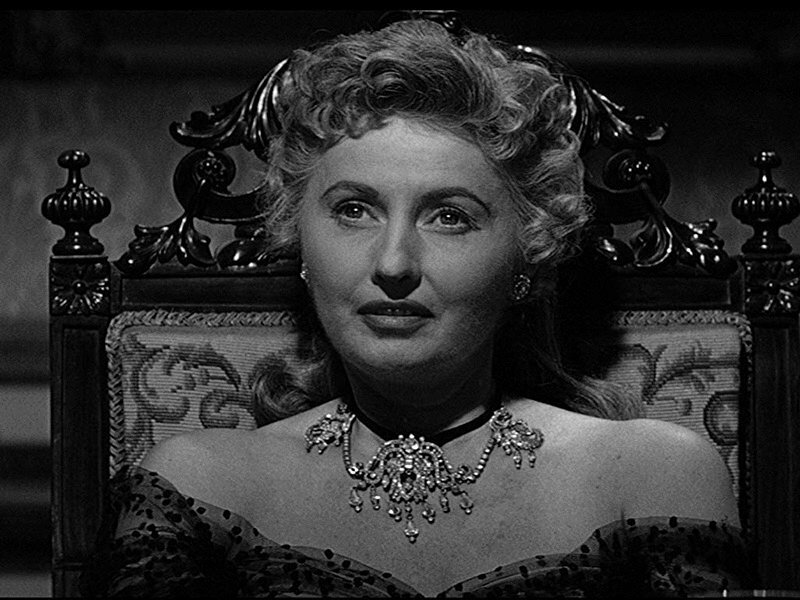 Film historian Imogen Sara Smith acutely notes during a Criterion Blu-ray extra that Forty Guns represents a "summation of Stanwyck's screen persona" and probably marks her last great role. A fair assessment. As Victoria Wilson has chronicled in her masterful biography, A Life of Barbara Stanwyck: Steel-True 1907-1940, Stanwyck came from rough origins. Her mother died when she was four-years-old. He father soon abandoned the family, leaving her eldest sister to raise four other kids. One cannot help read Stanwyck's acting style—restrained movement, a statuesque posture, and low solid voice—in part cast as a response to her dire upbringing and abusive first husband, Frank Fay. She's composed in all of her films as if keeping a coming storm at bay. Her stolid outward appearance provides an anchor for any inner turmoil her character might be experiencing or any external threats that might be looming on the horizon. Her best parts tapped into her childhood trauma and provided testimonies for overcoming it in fictional form. Baby Face (1933), perhaps one of the greatest pre-Code Hollywood films, has Stanwyck playing Lily Powers, a brash name that suggests how Lily will wield her sexuality to launch out of poverty and into the penthouse. Her character grows up in abject poverty. Her mother has fled her father. Her father pimps her out to men who inhabit the bar he runs. On the side, her father runs an illegal distillery. In a shocking scene, we watch her father blow himself up in the distillery. As Lily goes down to witness the event, we see the fire play across a close-up on her face. She impartially takes in the moment. Almost imperceptibly, a smile creeps over her lips. End scene. This scene encapsulates the Stanwyck screen persona at its best: always somewhat removed from the action taking place, not cold but cautious, normally holding her emotions on a tight leash. Jessica Drummond in Forty Guns similarly represents a character with rough origins who plays into this archetype. Drummond alludes to her sordid past when flirting with Griff. She gestures towards a barn and calmly notes: "I was bitten by a rattler in there when I was fifteen." She later clarifies that the "rattler" was really one of the work hands on the farm "who tried to get rough" with her. Her father, no hand with a gun, was shot in the process of defending her. This all comes after Drummond's mother had died during childbirth years earlier having Jessica's younger brother, Brock (John Ericson). Jessica was left to raise him on her own after her father's death. This sense of self-preservation and steely resolve manifests itself when we see Jessica the second time in the film. Brock has been jailed due to shooting the town's sheriff in the leg. Jessica comes to visit her younger brother in jail. Stanwyck relates her confidence and certainty in the way she commands her body while entering the scene. The crowd outside the sheriff's office parts as Jessica strolls in, back straight, unperturbed. She walks directly to Brock's cell, focused and ignoring those around her. After checking on her brother, her first two question are: "Where is the man who assaulted my brother? Why isn't he locked up?" She is immediately on the offensive. Despite Brock being a notorious good-for-nothing, Jessica asserts his defense. This is a woman one doesn't want to tangle with who essentially controls the entire territory—business, politics, and all. The story in essence is a reworking of the big city corruption theme that often pervades film noir. But in this case it's transplanted to the Western, and the cigar smoking big city boss who has a stranglehold on the scene is replaced by Jessica Drummond, "the woman with a whip", as she is described by a folk tune within the film. Additionally, rather than demonizing her reign over Tombstone, Arizona, the film sympathizes with her and establishes a romantic interest with the very person who should be trying to bring her down, Griff. Black and white moral issues blur into a hazy gray, not unlike the shadows that pervade the film's the low-key lit sequences. The film's high contrast and ominous noir lighting suggests how urban civilization encroaches upon the frontier under its pall. Critics have often tried to explain away the film's reactionary ending that has Jessica doing an abrupt reversal, her independence sacrificed by desperately chasing after Griff as he rides out to California when his role as a hired gun is no longer required. According to the original script, Griff was supposed to kill both Brock and Jessica, who Brock is holding as hostage, but studio audiences didn't react favorably to killing the film's female lead. So Fuller tacked on an alternate ending, not all that unusual for studio films at the time. Imogen Sara Smith, for example, engages in mental acrobatics by claiming that Jessica is actually stronger than Griff in the film's new ending, since she was able to forgive him for shooting his brother while he could not forgive Brock for killing one of his own brothers. Smith's argument is weak at best and overlooks all the other ways in which Forty Guns consistently undermines Jessica's independence. For example, almost immediately after her powerful entrance into the film, a song plays, with lyrics emphasizing her taming: "But if someone could break her/ And take her whip away / Someone big, someone strong, someone tall / You may find that the woman with a whip/ Is only a woman after all". So already the film announces Brock's main role of exposing and taming the woman who seems nothing less than a force of nature during the film's opening. Not coincidentally, Griff's taming of Jessica comes precisely when another force of nature threatens their existence: a tornado. Jessica, inexplicably, falls from her horse and is dragged by it as her boot is caught in a stirrup when the tornado's winds arise. Griff, needless to say, rescues her by carrying to her a nearby barn where she admits she is in love with him. One could have a field day applying Laura Mulvey's theory of the male gaze on the film. Forty Guns follows in the pattern of many classical Hollywood films that ultimately punish and tame strong female characters in order to ultimately assert the patriarchal order. There could be no greater threat than Jessica Drummond. In his autobiography, an except included in the Blu-Ray liner notes, Fuller states upfront: "My forty guns were forty pricks. My powerful heroine had her way in the sack with all forty, then cast them aside for the forty-first 'gun', Griff." But the problem is, according to the logic of classical Hollywood narrative sexism, Jessica possesses the real phallus throughout the film. She is the boss. She takes what she wants. She commands the range. And, ultimately, she must be punished and diminished for it, which she is by being dragged by a horse throughout the tornado scene and ultimately shot by Griff at film's end and left groveling for companionship in the final scene. Yet, interestingly enough, another woman remains strong throughout the film: Louvenia "Lou" Springer (Eva Brent). This is also typical of some classical Hollywood films: a strong female protagonist is ultimately punished and either killed or tamed, but less visible women at the film's narrative margin survive. Griff's brother Wes (Gene Barry) falls hard for the female gunsmith. Dressed in overalls and cap, Lou confidently throws Wes a rifle when defending his brother during a showdown. She aggressively flirts with Wes early on when fitting him for a rifle. She takes his face in her hands caressing his face while saying suggestively, "You have a high cheekbone and a low shoulder." 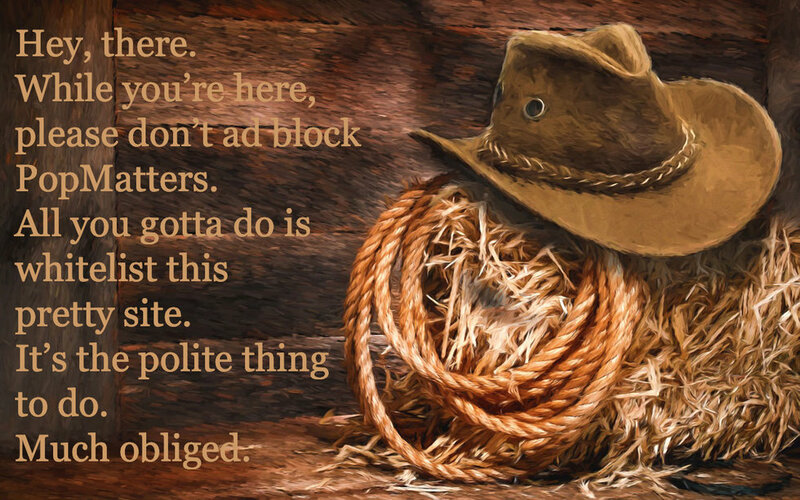 He replies: "Gonna make trouble for you?" She responds, "Nothing I can't handle." Later, when Wes asks her who is the best shot in the territory who might have killed another man, she replies matter-of-factly: "I didn't shoot him." He corrects himself: "After you, who is the best shot?" Of course, Louvenia is punished by having Wes killed right after they are married. But at least she survives and maintains her strength and dignity throughout. Yet like many classical Hollywood films where strong women are relentlessly punished by narrative's end, their moments of strength prevail. No one, for example, will forget the opening sequence as Jessica rips across the plains like a force of nature with 40 men trailing in her wake and the Bonell brothers dead in their tracks, unaware of what just transpired. Fuller fans remember Stanwyck's presence and performance throughout the film. They would most likely have difficulty recalling the name of her male co-star. Imogen Sara Smith stresses how the different styles of Fuller's over-the-top camera work nonetheless melded well with Stanwyck's restrained performance. Tellingly, the camera normally remains focused on Stanwyck when she enters the scene; its movement stabilizes as her performance seizes control and orients the story around her presence. The Blu-Ray is filled with other hagiographic and superfluous extras like Fuller's wife and daughter gushing about how great he was and a documentary that is based upon famous actors reading lines from Fuller's autobiography. The extras are mostly as pulpy as the film's storyline, which at least provides some form of consistency. But Forty Guns remains a remarkable film that fuses the Western with film noir and provides ample space, at least during its first half, for Stanwyck to provide a commanding performance that hints at what a Western female heroine might look like.